Back Row from the left: Scooby Doo, Goofy, Underdog, Astro (from the Jetsons). Front Row from the left: Snoopy, Droopy, Grimmy (from Mother Goose and Grim comic strip) and Ren (from Ren and Stimpy animated TV show). 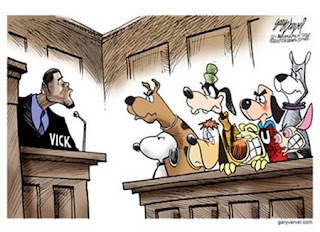 Professor Peabody, Pluto, and Huckleberry Hound were smart enough to get out of jury duty, lol! !